If you’re new to the Oud, it’s essential to keep your strings in tune. It’s common for beginners to snap a string or two while trying to guess whether to tighten or loosen a string. Not any more! 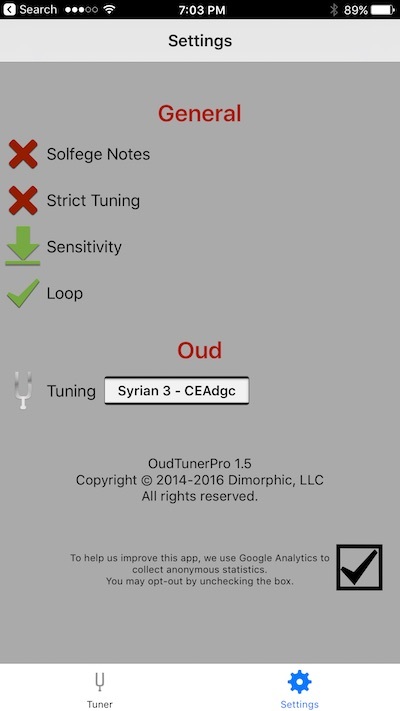 Enter Oud Tuner Pro! With its automatic mode, Oud Tuner Pro helps you tune your Oud and avoid breaking strings by telling you when to tighten and when to loosen. 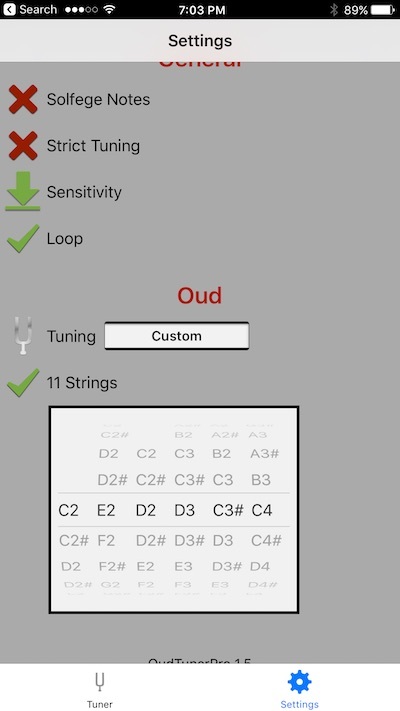 To begin tuning your Oud, you should select a tuning. You can do so in the «Preferences» dialog as shown in the figure 1. Use the «Tuning» slider to pick a tuning preset or define your custom tuning. To change the selected tuning swipe left or right on the white tuning area. While in preferences, you can choose whether you want to see «Solfege» notes (Do Re Mi) or ABC. You can also change the sensitivity and tolerance of the tuner. Turning the «Loop» on will continuously play the selected note until you tap the note button again. If you select custom tuning, you can choose 11-string or 10-string Oud. 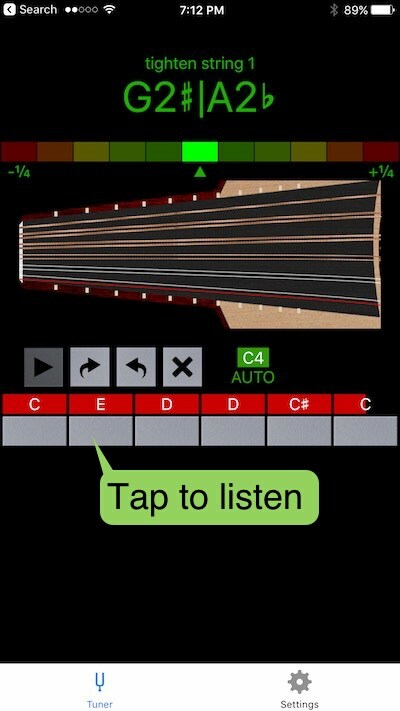 Switch back to the tuning screen and start auto-tuning by tapping the «play» button as shown in figure 3. You will notice that the first string on the Oud (bottom string) will turn red indicating that it’s the string being tuned. You will also see an indicator telling you that you are in «AUTO» mode and showing you the name of the note being tuned. In figure 2, we’re tuning the C4 string. You will see the list of notes at the bottom in red (they reflect your selected tuning mode), and you will notice that the first half of the first note is blinking indicating that we’re tuning the first part of the C4 string pair. Pluck the first string on your Oud, and you will see the note name displayed at the top in large green letters. Above the note name, the tuner will tell you whether you need to tighten or loosen the string to achieve the desired tuning. The string number is also shown for convenience. The meter below the note name will show you how off tune the string is. Your string is perfectly in tune when the center bar is lit. When that happens, the string will turn green, and the string above it will turn red indicating that it’s the next string to be tuned. 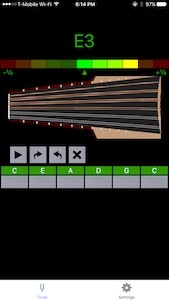 The bar corresponding to the tuned note will turn solid green. If for some reason, you’re not satisfied with the tuning, maybe because you plucked the wrong string on your instrument, you can go back by tapping the «back» arrow. Likewise, you can move to the next string by tapping the «forward» arrow. Once tuning is complete, you will see a message indicating that at the top of the screen and all the bars at the bottom will be green (see figure 3). To cancel tuning at any time, tap the «X» button. If you prefer manual tuning, all you have to do is pluck a string on your instrument and check the display until you reach the desired note. The meter at the top will help you tell how off your note is. You should aim for a single lit bar in the middle of the meter. Please note that in manual mode, the tuner will not guide you to tighten or loosen the string. You can also tap the button under each note in bottom row to hear the note. To test the tuner int auto-mode, tap the «play» button. Once tuning has started, tap the buttons below the notes. You will hear the notes and see the tuner lock on each note and advance to the next one until the tuning is complete. This will indicate that the tuner is operating as advertised. If you don’t hear the notes when you tap the note button, you can quit the app by tapping the home button twice and sliding the app off the screen. Restarting the app will resolve the issue.